Enjoy the top 22 famous quotes, sayings and quotations by Jeff Vespa. Well, I talk about one moment in the book, but I don't know if that's my moment of discovery. It was a moment. In the book, I talk about how I started shooting, how I became a photographer. It 2001 when we started. But prior to that, I had made this website called sundancepics.com, where me and this other photographer, Randall Michelson, could sell our images from Sundance online and it was successful. Steve Granitz, who's my main partner at WireImage, we were already working together, and I was like, "Look dude, this is it. We can do this." I ended up meeting this guy Stefan Simchowitz, who produced Requiem for a Dream and also went to AFI. I randomly met him in Cannes. By September of 2000, we had made a deal with this company that he was working with. They merged with us and in January of 2001, we opened WireImage. It was pretty crazy because I only started shooting celebrity stuff in 1998 - literally two and a half years later, I'm opening this company. So I tried to get my shot with a 50mm and I did it - this is when we're shooting film, not digital. The guy that hired me looked through the pictures and was like, "Oh, this is pretty good. You did a good job." And I was like, "Yeah, I'm sorry. I only had a 50mm. My girlfriend rented the wrong lens ... " and he stopped looking at the pictures and he looked up at me and he said, "You shot this with a 50mm? You're hired." 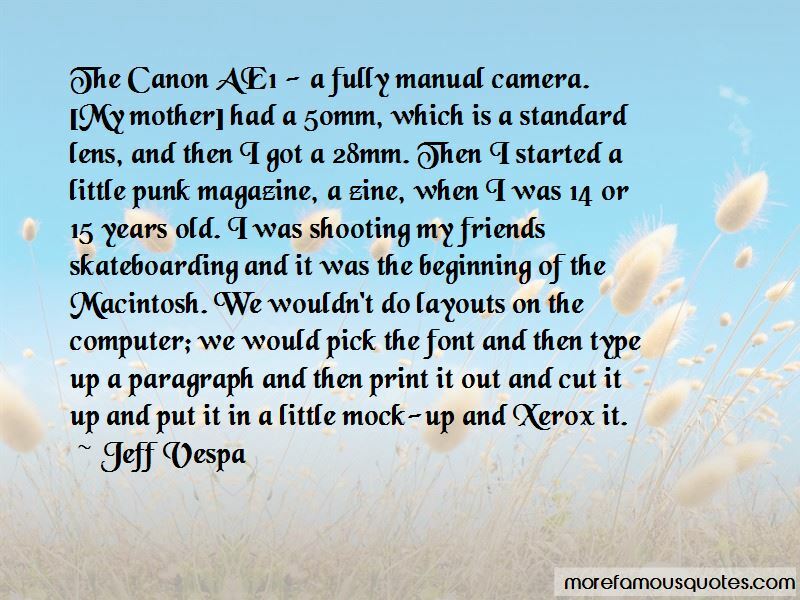 My mom had a Canon AE1 camera and I read the manual and that's basically how I became a photographer. I was in the Baltimore punk scene. I knew it was a special time, so I went out and documented that whole era. I was the only person to really do it of my friends in real black and white, beautiful portraits. Over the years, she [my mother] always encouraged me in the arts. She actually worked at an art museum when we were kids. I took classes there. She was the one that, when we'd go to the store and I would have a pack of eight pastels, she'd say, "No, get the 24-pack." She was always encouraging me to get the best materials, which was really awesome. We were little children, four or five years old, but they were all around the house and they made us look epic, like we were part of some story being told. My mom would have this woman come to our house and take photos of us. She did a photo book of us as well when I was one. I still have it. 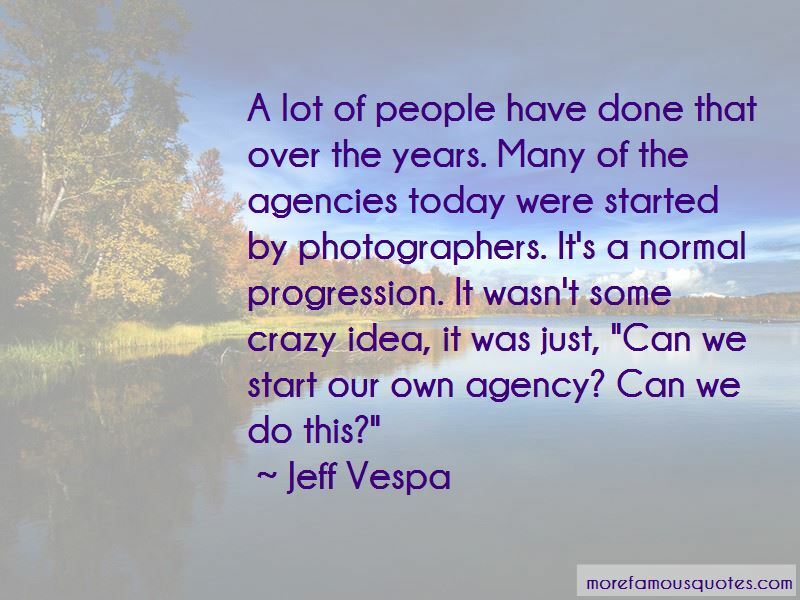 Want to see more pictures of Jeff Vespa quotes? 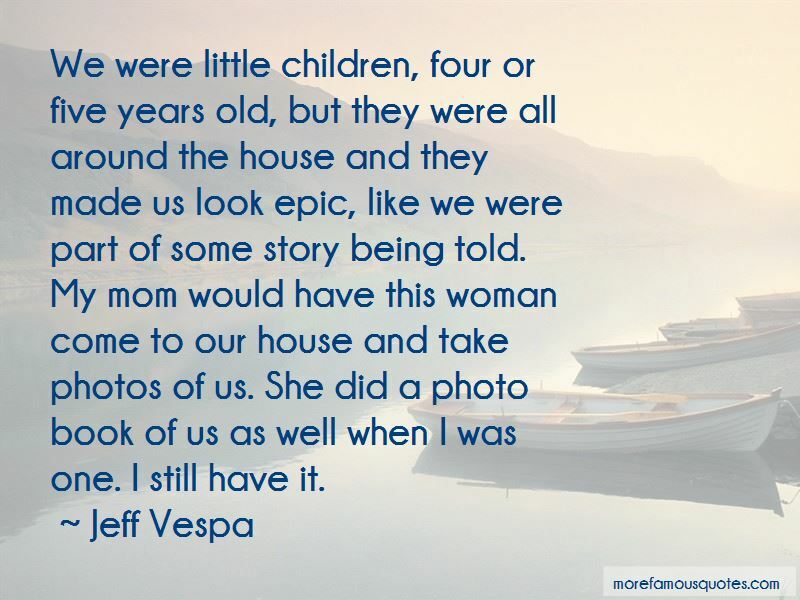 Click on image of Jeff Vespa quotes to view full size.